There is a hand-numbered limited edition seal on verso in red on the back of this print #185/250. The publisher seal for Watanabe appears there too. The reproduction of the Toledo catalogue from the early 1930s says that the falling cherry blossom petals indicate that the time of year is the spring. They suggest that there were about 10 blocks with 25-30 overprintings. Click on this print to enlarge it. In the upper right of the screen two images will appear. The lower one shows the seals on the back. There is a copy of this print in the National Museum of Modern Art, Tokyo. Illustrated in Female Image #69. 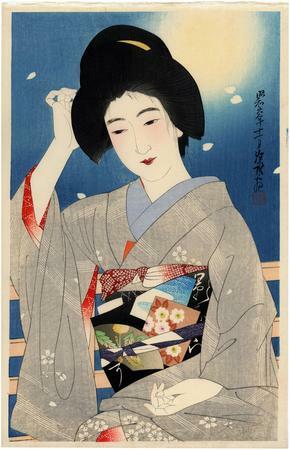 1) In a small black and white reproduction in Modern Japanese Prints, Toledo Museum of Art, #155. 2) In color in a full-page reproduction in 伊東深水全木版画 (All the Woodblock Prints of Itō Shinsui, Machida City Museum of Graphic Arts, 1992, #63, p. 102.